The Guest lecture was organized by IP department on 11/08/2018 for MCA Second Year students and the topic was "Managing Organizational Psychology". 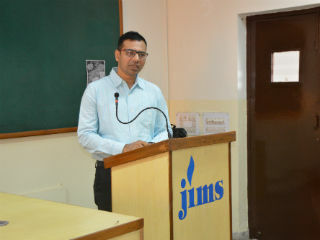 The session was conducted by Mr. Deepak Jindal from SAP, India. 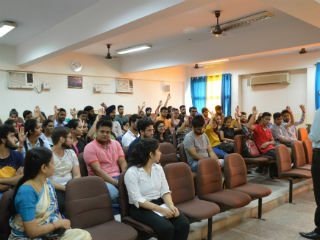 He provided useful information to the IT professionals regarding project management and time management. He also covered other aspects of personality management issues such as how to handle the people around us, how to turn negative aspects of people for gaining motivation. He also explained the importance of work preferences and specified how the clarity in preference leads to efficient work management and how that efficient work will helps in time management. The lecture also focused on the worth to make people understand why they are doing and what they are doing in their life to be successful. He also emphasized on the applicability of things in real life scenarios. He concluded his lecture by the following statement "Always learn, grow from the situations of your life". The participants assured the trainer as well as the faculty for applying these aspects in their day to day life. The session was very informative for learning organizational psychology.